#kinsale – Last weekend saw a good event combining the Naval Yacht Squadron Haulbowline Base, Monkstown Bay Sailing Club, Kinsale Yacht Club and Neil Prendeville's Mary P Trophy annual race and cruise from Kinsale to the Naval Base at Haulbowline writes Claire Bateman. There was a fine fleet of twenty two yachts. 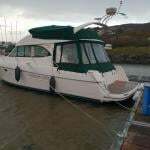 The Mary P Trophy race has been sailed for many years and this year was to be a special with the proceeds going to the Kinsale Sailability Class. On Friday, August 22nd the yachts set off from the Naval Yacht Squadron and Monkstown Bay Sailing Club to berth overnight at KYC where they enjoyed their first night of entertainment of the weekend. On Saturday morning they departed KYC for a 12.55hr first gun leaving the Bulman to port and then on to Cork harbour where they left No. 18 to port, 20 to port and then finished between the naval tower and No. 15. 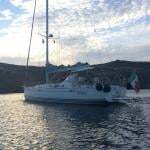 The highlight of the cruise was the evening reception held at the Naval base, by kind permission, and the yachts berthed overnight at the base before departing on Sunday for their home clubs. 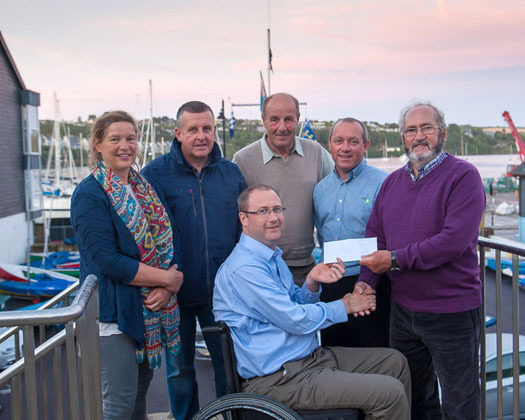 Last night (Wed) at Kinsale Yacht Club the culmination of this event took place when the proceeds of the entry fees were presented to the Sailability Class Captain, Kevin Downing. This class was formerly known as The Access Class. Next month, September (2014) Kinsale will host another event to be called the President's Cup. This will be awarded for interprovincial racing to be held between the various sailability classes. It has been named the President's Cup to honour John Twomey's tenure as President of the IFDS (International Federation of disabled sailors).